Don’t mess with my Eyecreams! A few weeks ago, a sad thing happen (a bit of overexageration never harmed anyone..;)) , I managed to lose my favorite (and only) full size eye cream in my tiny room (you wouldn’t think it is actually possible given the size of the room, yes yes, once again I did it) anyway. Losing my BOBBI BROWN Extra repair cream almost makes me shed a tear (almost!!!). 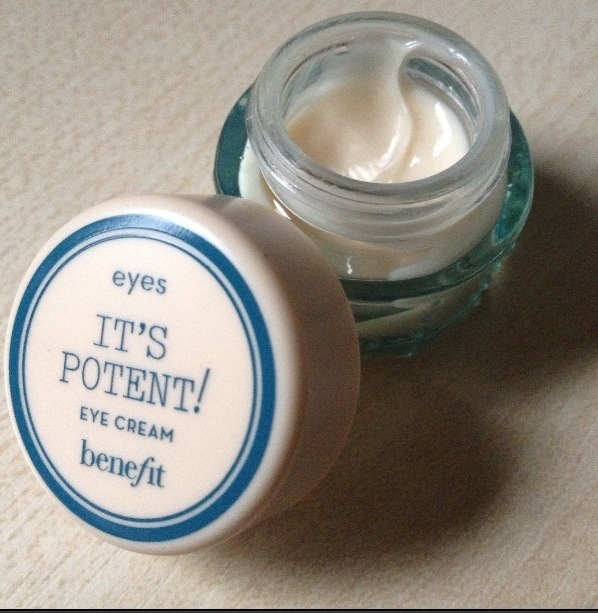 I mean it’s like the Rolls-Royce of all the eye creams I’ve ever tried. it has cost me a Limb but let me tell you, I would spent that money again as I used it consistently for the last 8 months and the pot was only half empty and I loved the results . Once I realized I did lose it, I was on the hunt for a transitional eye cream. I found a sample of BENEFIT It’s potent in one of my drawers, and I have to say that I didn’t expect this to be as good as it is. My worst problem with my face, except my really sensitive skin, is my dark circles. I am simply too busy living to sleep as much as I should so my dark circles are like my worst enemies and somehow I find them quite difficult to cover up: yep, I just want them gone. I am not saying that this cream is working perfectly and that everything disappeared, no ! but I definitely see a huge difference in a good way, WONDERFUL! The off-white colored cream is in a pot, but not really thick. Once applied to the skin the consistency is very light and moisturizing and somehow really brightening. And I am not even talking about the packaging in a retro looking glass jar: I love it! It is the first BENEFIT skincare product item that I’ve ever tried and I am quite surprised! I really cannot wait to try the rest of the range. The full size of this cream retails for £24.50 for 14g of product.